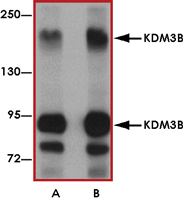 Sample Data :Western blot analysis of KDM3B in rat liver tissue lysate with KDM3B antibody at (A) 1 and (B) 2 ug/mL. 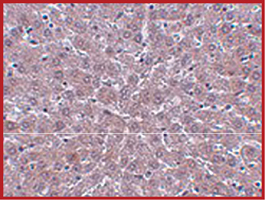 Sample Data :Immunohistochemistry of KDM3B in rat liver tissue with KDM3B antibody at 2.5 ug/mL. 1. Lai F et al: cDNA cloning and genomic structure of three genes localized to human chromosome band 5q31 encoding potential nuclear proteins. Genomics2000; 70:123-30. 2. Hu Z et al: A novel nuclear protein, 5qNCA (LOC51780) is a candidate for the myeloid leukemia tumor suppressor gene on chromosome band q31. Oncogene2001; 20:6946-54. 3. Baik S-H et al: DNA profiling by array comparative genomic hybridization (CGH) of peripheral blood mononuclear cells (PBMC) and tumor tissue cell in non-small cell lung cancer (NSCLC). Mol. Biol. Rep.2009; 36:1767-78.